“Come eat at Canlis,” read the invite, which went out to a dozen Seattle chefs on behalf of brothers Mark and Brian Canlis and their chef Jason Franey, who were hosting the May dinner. Solomon Leson came to this country as a boy of 13, never lost his thick Russian accent and grew up to raise four sons — along with an even larger brood of homing pigeons. He made his living as a butcher, went broke doing it, and regularly found solace from his troubles on the roof of his home in South Philadelphia. I adored him. “Zayda! Take me up on the roof!” I’d beg my granddad. “I want to see the pigeons!” Time and again he’d insist I was too young and it was too dangerous. Which, come to think of it, was what he’d say when I begged him to tell me about what it was like growing up in the old country. I was in my teens before he ever let me get a look at his pigeons, and in my twenties when I took one last photograph of the retired butcher holding one of his fine-feathered friends. Zayda Sol, up on the roof in South Philadelphia. 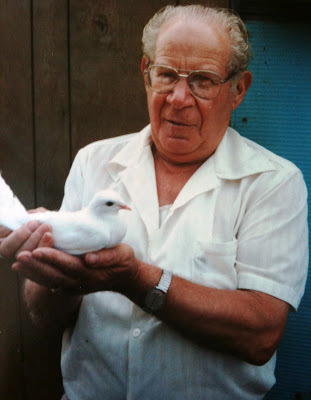 My grandfather eventually caved regarding his birds, but steadfastly refused to talk about growing up in Russia — save to tell me that when he arrived here in the “goldene medina” it was Easter-time. And though the streets weren’t paved with gold, as he anticipated, there was chocolate to be had, something he hadn’t tasted before. His father gave him a few coins and he and my great-uncle Sam bought a bag of chocolates, sat down on the not-so-golden street corner in Philadelphia, and ate themselves sick. 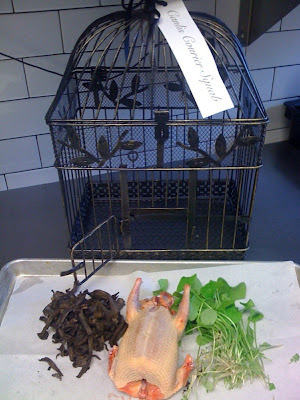 So, I asked (having heard about the Canlis party-pigeons), what are you going to do with the squab? “I killed it,” Stratton replied. He’d also plucked it and gutted it. “They’re a great squab,” he said as explanation. 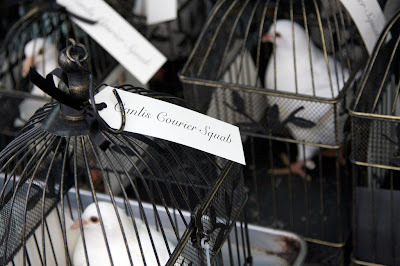 “They came from Mad Hatcher in Ephrata — and they grow amazing squab.” What’s so amazing about it, I asked. 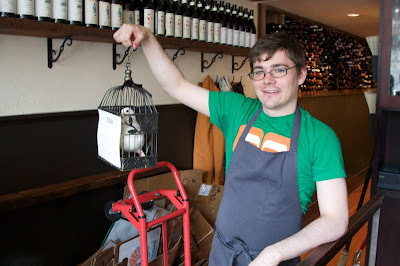 “Well, squab’s always tricky, because it’s hard to get it fresh, not frozen” — unless you call the folks at Mad Hatcher and ask them to dispatch a flock. Or hang out at Steinbrueck Park, but that’s another squab story altogether. So far, the demand for the fresh squab at Spinasse, where the new menu makes great use of caul fat, bone marrow and tripe, has yet to reach gotta-stock-it proportion. “But we can say we need 10 or 20 and they’ll bring them to us,” Stratton said of the Ephrata outfit, whose birds were on the menu a couple weeks ago. That said, “I don’t think I’d go out and try to wring a pigeon’s neck,” insists the otherwise gentle chef. Unless, of course, one shows up unexpectedly, in a cage, on his doorstep. OK, so you killed it, now what are you going to do with it? I asked him. “Cook it for dinner,” he said. For yourself? “No, for whoever wants it.” Make me a reservation for the counter, I’ll see you around five, I told him. 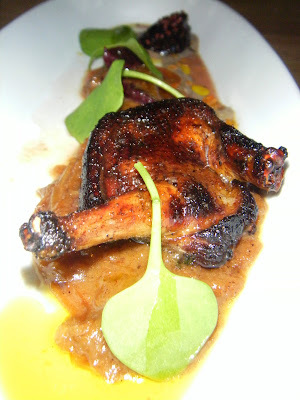 And that’s how I ended up at Spinasse early Saturday evening, sliding in before the rush to await my squab dinner. Seated at the other end of the counter was Chefs vs. City star-chef Chris Cosentino, dining with his wife and young son. “Maybe you should give Chris half the squab,” I told Stratton, knowing that Cosentino came close to winning season one of The Next Iron Chef — with squab as one of the “secret ingredients.” And as those who follow the San Francisco-based chef know, for Cosentino — who blogs at www.offalgood.com — it’s all about waste-not want-not, the bedrock of head-to-tail cookery. Of course there was another far more important reason why I was willing to share “my” squab: If I ordered only half the bird as a secondi, I’d have room for antipasti and tajarin. Done! 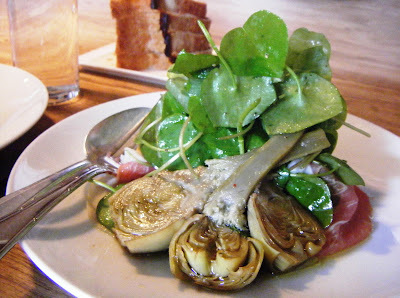 My insalata de carciofi e prosciutto di Parma — hamming it up with olive oil-poached baby artichokes and miner’s lettuce. 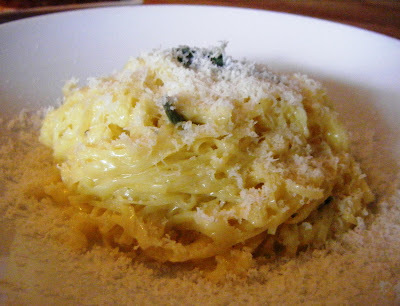 Tajarin al ragu o burro e salvia (that’s hand-cut egg pasta with butter and sage). Be still my beating heart (and squab liver, served on the side). It was by far he best squab I’d ever eaten. 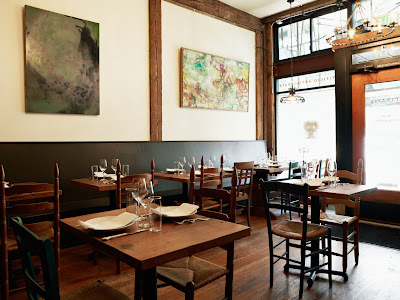 What’s more, the squab-story gave me a good excuse to check out the new look in the dining room at Spinasse, heretofore filled with communal tables. In addition to making significant changes to the menu, Stratton has also made the Capitol Hill trattoria far more comfortable for those who’d rather not have such an intimate experience with strangers, by replacing the “family-style” tables with deuces and four-tops. The new, improved dining room at Spinasse. Photo: courtesy Thomas M. Barwick. Which, considering how many people would be appalled at the thought that there’d been a squab sacrifice in-house (and a woman sitting next to them licking her fingers after making short work of it) is probably a very good thing. I later learned Stratton wasn’t the only one making good use of his party favor. Over at Tilth in Wallingford, Food & Wine Best New Chef-alum Maria Hines was having a pigeon party too. 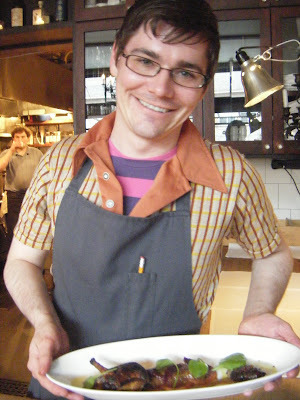 But she called on Larkin Young, her chef de cuisine (and a “Best New Chef” to watch) to do her dirty work.